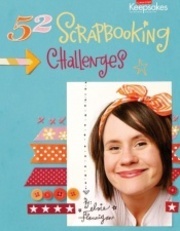 So I have to admit, a book on scrapbooking challenges doesn't shout out "you need this" - especially with so many forums, websites and now weblogs out there dedicated directly at giving our scrap blocked brains a jolt of something new and different - but along with so many others, I am amazed by Elsie's talent and skill and I just had to add this book to my collection. So with a long drive from Canberra to Melbourne ahead, I bought my copy to help get through the 8 hours of white dashed concrete! Flicking it open, my eyes were grabbed by the amazing layout on page 6 - so much texture, creativity, style and balance. Elsie manages to combine artisitc elements such as paint and ink, but retain balance and structure, and it is this, along with her use of bright colours and ability to always think out of the square that captivates me. So with such a great intro, I devoured this book, and it is amazing, admiring not only Elsie's interpretations of the often simple challenges, but also the other talented scrapbookers who take a much cleaner and different approach. This book is essentially a book of inspiration, with surprise surprise 52 challenges and a good handful of extra hints along the way and at the back. Each challenge is set out over a double page with a heading, some ideas then three layouts showcasing how the challenge has been interpreted. Attention has been paid to the display of the layouts and design allowing you to clearly see what the designer has done with their challenge. For a beginner to intermediate scrapbooker, this book is virtually a must have reference book for whenever you feel in a rut, scrapblocked or just want to kick start a change (when your layouts are tending to becoming 'sameish'). Flick open to a random challenge or work your way through and you'll sure to be bursting with ideas, and a strange desire to add lots of bright elements to your next project. There are also several step by steps on how to create certain techniques! For advanced scrapookers, I don't think the challenges will be found incredibly new, rule breaking or out of the box type stuff, but that is not to say that this book is not for you. The way that Elsie and the other contributors including Melette Bereoski, Joy bohon, Maria Grace Abizman, Kendra McCracken, Traci Turcin, Rachel Ludwig, Vicki Harvey, Julie Scattaregia and Danielle Donaldson interpret them is nothing short of amazing, and I found that this coupled with the many other aspects and inspiration that I could draw from their unique and varied approaches, make this book a winner to me as well. All in all it is a bright and fun book which reflects a mix of structured and the ever so hot 'free' style of scrapbooking. There is also plenty of Elsie between the covers with well over 50 layouts in there, which makes this a must for any Elsie fan! For me there is so much to be gained from this book and for the purpose of this review I have chosen to tackle one of the challenges (in this case #42, which is to create a stylish photo frame). I love the way that Elsie has done this with her layout 'There are times'. So in addition to taking on elements of her design I've also adapted her fun and funky colour combination (but in reverse) to create my layout. Welcome to the Aussie Scrap Source blog. We hope that you will find this blog to be a source of information and inspiration. Here we will showcase products, review various books and tools, let you know what is happening with our class kits, keep you up to date on various competitions that we are running, share information from our suppliers and update you after major trade events. We will be presenting information and ideas on different techniques and putting our Design Team to the test to develop projects using those techniques and ideas. We will also be searching for and showing off layouts that we come across that feature the products that we represent. We will strive to keep this blog current, relevant and informative. We do hope that you come back to visit us often.